Life is filled with difficulties, but Christians often face an unseen enemy—leading to difficulties of and within the soul. 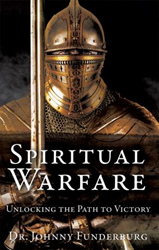 Dr. Johnny Funderburg’s new book, Spiritual Warfare: Unlocking the Path to Victory, ($12.99, paperback, 9781545611982; $5.99, e-book, 9781545612484) equips readers with the knowledge and tools necessary to fight their spiritual battles. Every Christian must learn how to enter into and come out of the ring as the victor against Satan. Dr. Johnny Funderburg is a pastor with more than thirty years of experience and has preached at a number of revivals. Dr. Funderburg received his Master of Divinity degree, as well as a Doctorate of Ministry degree. Xulon Press, a division of Salem Media Group, is the world’s largest Christian self-publisher, with more than 12,000 titles published to date. Retailers may order Spiritual Warfare: Unlocking the Path to Victory through Ingram Book Company and/or Spring Arbor Book Distributors. The book is available online through xulonpress.com/bookstore, amazon.com, and barnesandnoble.com.